This four bedroom detached home can be found in the sought after Knightwood Park development, this property is also within Knightwood and Thornden School Catchment. The property benefits from a utility, ensuite, conservatory and integral garage making this an ideal family home. CLOAKROOM 5' 07" x 2' 11" (1.7m x 0.89m) Small basin, WC, radiator, laminate flooring. LIVING ROOM 16' 04" x 11' 02" (4.98m x 3.4m) Gas fire, double doors to conservatory, radiator, laminate flooring. DINING ROOM 12' 02" x 9' 02" (3.71m x 2.79m) Window to front. STUDY 10' 02" x 8' 02" (3.1m x 2.49m) Window to front. KITCHEN/BREAKFAST ROOM 11' 02" x 8' 11" (3.4m x 2.72m) Space for free standing dishwasher, fridge freezer you will also find a gas hob and electric oven, possible space for small table and chairs, with base and eye level units, door to utility room. UTILITY ROOM 8' 0" x 5' 06" (2.44m x 1.68m) Base units, stainless steel sink, space for washing machine and tumble dryer, door to garage and garden, window to garden and wall mounted boiler. MASTER BEDROOM 15' 01" x 9' 02" (4.6m x 2.79m) Window to front and ensuite. 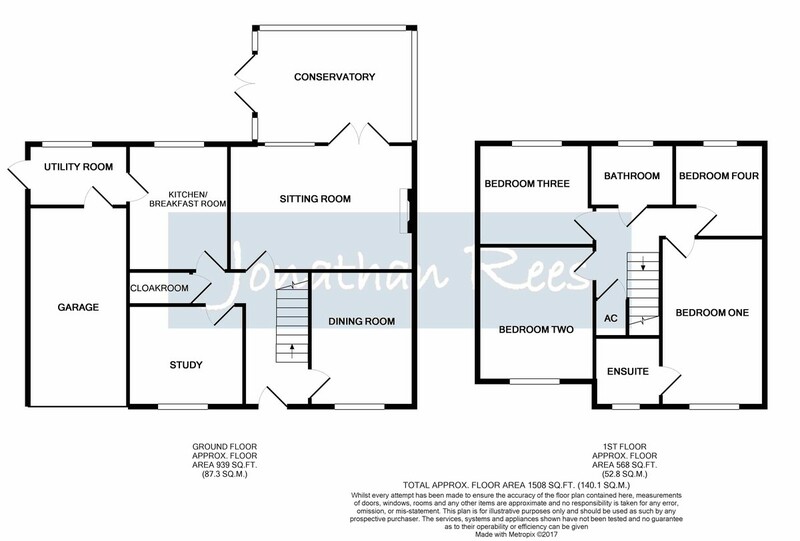 ENSUITE 6' 02" x 5' 07" (1.88m x 1.7m) Shower, vanity basin, WC, towel rail, window to front, tiled throughout. BEDROOM TWO 11' 10" x 10' 01" (3.61m x 3.07m) Window to front aspect. BEDROOM THREE 10' 01" x 8' 11" (3.07m x 2.72m) Window to rear aspect. BEDROOM FOUR 7' 11" x 8' 07" (2.41m x 2.62m) max Window to rear aspect. BATHROOM Vanity basin, WC, shower over 'Whirlpool' bath, towel rail, window to rear, tiled floor. GARAGE 17' 08" x 8' 09" (5.38m x 2.67m) Integral with up and over door, power and light. OUTSIDE The front is mainly laid to tarmac with mature borders. The rear garden is mainly laid to lawn with a patio and side access to the front.